What I thought was just a speech screening ended up being boardroom table full of specialists who were going to observe not just his speech, but behavior, motor skills, etc. to do a complete screening of his development. One of their developmental tests was scissor cutting (something I had never worked on with him previously). They sat him on the floor with kid scissors and a scrap of paper. The child was amazing. He successfully used the scissors, with good grip technique, and cut that piece of paper into a hundred little triangles! I didn’t even know he could use scissors! provides practice in using the tripod fingers (thumb, forefinger and middle finger) together. The tripod fingers are what work together in controlling a pencil. Developing the proper pencil grasp attributes to good handwriting. This is just the tip of the iceberg! Check out Scissor Cutting Skills: Why they’re important and how to learn ’em to get the full scoop on the benefits to teaching scissor skills at a young age. So the quest was on! We were in cutting mode and we needed something fun to practice on! My boys were absolutely thrilled when I ran across some cute Halloween cutting sheets. However, when I went to find some for Thanksgiving, I wasn’t satisfied with what I found. So I made my own. And then, I couldn’t help myself… I just had to keep creating them! Christmas cutting sheets, winter, Easter, construction trucks! 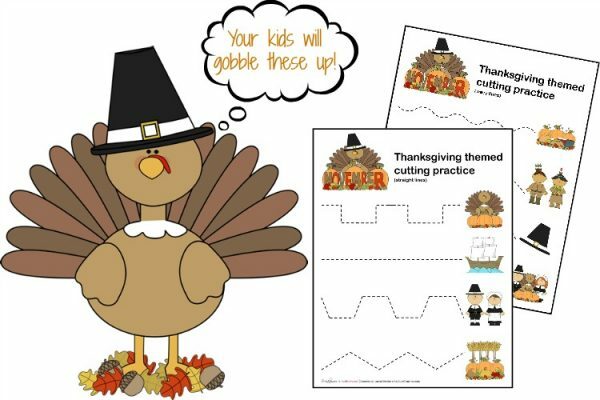 Oh my goodness, they’re so much fun, your kids are just going to gobble up these printables! 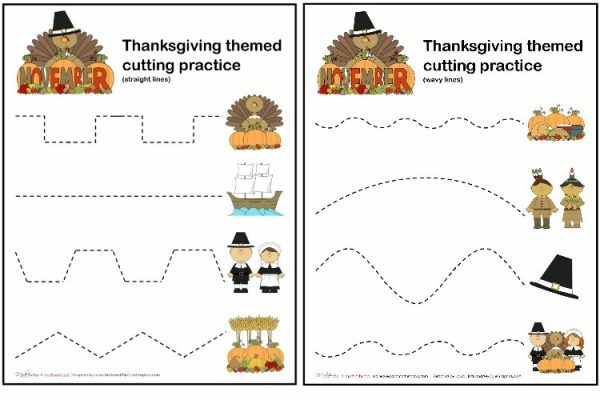 Click on the above graphic to download your free Thanksgiving scissor cutting practice sheets. If you have a beginning cutter, these lines may be a little challenging for them. That’s okay! Give them the challenge. Let them have fun. See what they can do! My middle child’s first time with these sheets, he didn’t even use the lines. He just cut the paper into strips and then into “shapes”. The colorful page and turkeys and scissors were enough to get him excited and wanting to learn! With regular cutting practice your child will master these lines and scissor skills quickly! I just pinned this to print out later! Thanks for sharing these sheets! Thanks so much for sharing this Deb! We’ve been having so much cutting fun that today’s post are Christmas Cutting Practice printables! Enjoy!